This was the view from our back balcony of the place we stayed in France while doing the portrait figure course with Rita Natarova. Every morning I'd wake up to those lovely white cows when I looked out my window, so one morning I decided to try and paint it. It's my first attempt at painting buildings and animals. It took around 2 hours, the painting seemed to paint itself. The studio was situated in the gorgeous rural medieval village, Argenton-Chateau, about 45 mins drive south-ish from Angers. Maybe 2 hours from the west coast, and toward the south of France. It was quite a challenge due to constantly shifting light. The still, clear sunny morning which seemed like it would go on that way all day long decided to call in the clouds. 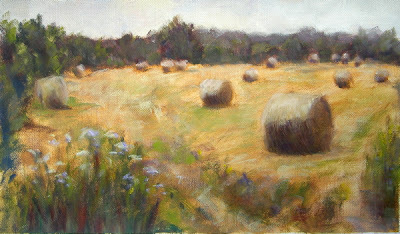 I had begun at a leisurely pace in the sunshine, blocking in a basic underpainting and basic composition and then, as I was beginning to work the light on the haybales, the clouds turned up and began playing dancing games with the sun. This went on back and forth for awhile until eventually the sun disappeared altogether, and at one point there were even a couple of spots of rain, with the sky remaining overcast for the rest of the day. I may still crop this a weeny bit. I still have a lot of canvas mileage to clock up before I feel able to take full command of (or complete surrender to) a situation of such changeability to its success! But.... I also need to add that producing high quality work when painting outdoors is really only icing on the cake. The process of just being out there, becoming one with the land and the day is really where it's at for me. Painting is an excuse for me to justify spending some quality time hanging out with nature. There's something so special about this process, something there are no words to describe, perhaps it's a secret that outdoor painters share. When I first saw your work I thought you were an okay kind of painter. Since you went to France I think your painting has become superb. The haybales landscape and the roses have a very real quality about them. I now think you're an artist. Thanks for popping in, Ian, glad you like the paintings. I certainly grew a lot from that trip. Ah, France, it seems like such a long time ago now! I still have a few others from that trip to post, perhaps I'll have time for that before Xmas!